What’s the ROI of Building a Deck? You might have several home improvement projects on your agenda, but what makes building a deck the best investment? On first thought, a new deck increases usable living space that your whole family can enjoy without needing to break the bank. Installing a deck costs a lot less compared to building a home addition or converting an attic, for example. It’s part of why a new deck provides one of the top ROI’s of all remodel projects. But with all the options and decking companies that are out there, how do you know where to start? According to Remodeling Magazine’s Cost vs. Value Report, a homeowner can recoup nearly 80 percent of the cost of building new wood deck during resale. Consider that you can recoup about 78 percent for a bathroom remodel and 69 percent for a family room addition. Wood decks also provide distinct outdoor beauty to your home that will surely appeal to prospective buyers down the road. A high-quality wood deck increases curb appeal, while also adding to its perceived comfort and living space. 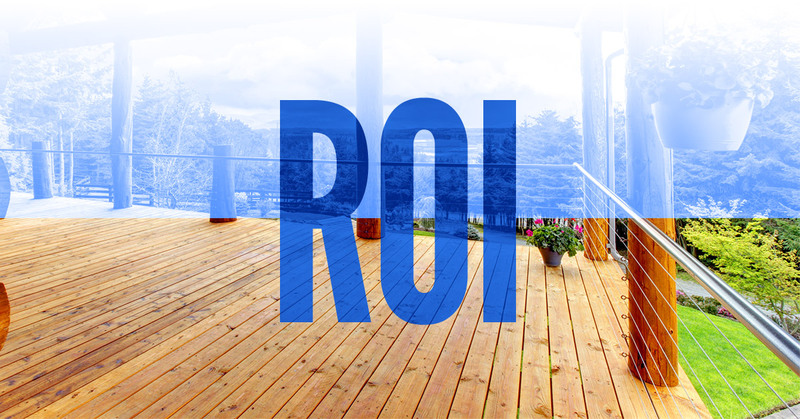 Before you get started contacting a deck contractor, check out these factors that impact your deck’s ROI. Material – Your deck’s material is critical in terms of resale value. Keep in mind that decks constructed using composite material see a significantly lower ROI than wood decks. The local deck builders at Ready Decks use only the best materials. You can feel confident knowing that our decks are made using premium-grade, treated lumber. Deck size – If you want a beautiful deck in time for the summer, remember that it should be used as a comfortable living space. You may be picturing future barbecues and other gatherings with friends and family. That means that your deck should easily fit a grill, large table with chairs, and potentially storage. Ease of access – You may have the room for a deck, but will it be convenient to access and, most importantly, enjoy? Ideally, you want your deck to be a few steps away from your kitchen or living room. The ‘wow’ factor – A deck that’s well-designed and includes some additional features encourages people to spend more time outside. That kind of deck grabs the attention of prospective buyers in a hurry. For the last 16 years, our team at Ready Decks has been creating incredible, affordable decks for homeowners. We’ve kept our business model in the same in that span: provide the highest quality decks in the shortest time possible while offering the greatest value. It all starts with the materials, which we briefly discussed earlier in the post. We then combine those high-quality materials with our innovative, patent-pending building system. The two enable your deck to withstand the test of time. Each and every deck we build is backed by a lifetime-limited warranty so that you can feel confident in our final product. So when you choose Ready Decks as your deck installer, you’re getting a company that prides itself on quality, value, and integrity. Ready Decks currently has locations in Texas, Louisiana, Arkansas, and Mississippi.